Read FBC Review of "The January Dancer"
Read FBC Review of "Up Jim River"
INTRODUCTION: "In the Lion's Mouth" is the third *but not* final book in the series that started with "The January Dancer" and was followed by "Up Jim River". In my reviews linked above, I described these books as "Celtic space opera". "The January Dancer" was both intriguing and well executed but "Up Jim River" had some structural issues that detracted from my full enjoyment, so "In The Lion's Mouth" was a book I planned to read but did not expect to engross me so much that I literally could not put it down one recent evening I started seriously reading it, until very late when I finished it. Besides how much I enjoyed it, the major surprise was that the series was not a trilogy as this novel ended on a (semi) cliffhanger and the direction of the fourth installment has now clearly been set. OVERVIEW/ANALYSIS: I will present a rough outline of the set-up - there is more in the above reviews - and of course the following has inevitable spoilers for the previous two books, though as I would say that a major part of the series' attraction is its execution - style, characters, world building - these spoilers are not that important in detracting from a new reader's enjoyment. In the far future, humanity is split into two parts by the structure of space time, as ftl is possible only through special "hyperspace tubes" where somewhat different physical laws hold - eg the speed of light is still the supreme such but it is much higher than our c - while being still close enough to allow human ships to go. The originally settled core including the now downtrodden Earth is called The Commonwealth of Central Worlds and is dominated by a dictatorship of "Those of the Names", humans (?) with special powers and of sinister reputation, while their secret police, the "Shadows" enforce their rule. However most of the action so far took place in the former "wild", across a huge gulf of space with few and narrow such hyper-tubes connecting it with the "core", where undesirables thrown in exile a long time ago fashioned various civilizations, most notable being the United League of the Periphery with its Celtic overtones I have been mentioning and with the "Hounds" being the analogue and of course sworn enemies of the Shadows. So two threads, one taking place in a short period of time and going forward where Ravn is cautiously listened to by Mearana, Bridget and her ready to shoot on sight minions, and the other that has already taken place and involves Donovan and his unintended return to Commonwealth space where civil war is brewing and some of the rebel Shadows seem to need him for their reasons. As in "Up Jim River", Donovan and his multiple split personalities is the star of the novel, while this time Ravn is his "sidekick" - ok part captor, part friend - rather than Mearana, while here the girl and her mother are more of bystanders, though they both exude strong emotions as Ravn keeps narrating and Donovan's fate seems to be sealed.. Or is it? Prepare to be surprised as twists and turns abound when the action moves into the "Those of the Names" space and a lot of past mysteries and revelations appear taking this series to the next level. 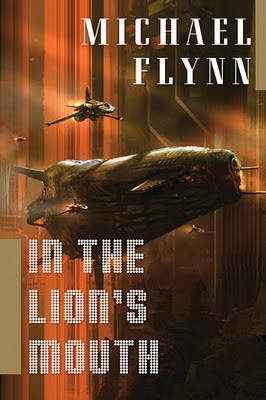 The same archaic prose style works wonderfully here - no more silly accents and no more exoticisms that conflict with it either - and "In the Lion's Mouth" (top 25 novel of mine) shows Mr. Flynn on top of his form, while the next installment moved back to my "highly expected, get and read asap" list.